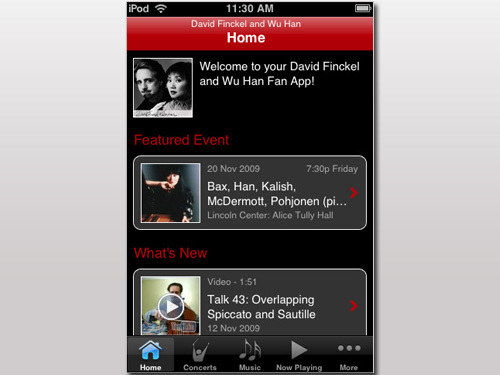 David Finckel and Wu Han are proud to announce the availability of their new iPhone application. Download to your iPhone or iPod touch, and receive up to the minute concert listings, blog posts, Cello Talks videos, and more. The eighth is the last of the numbered positions I will talk about. It is the most essential and easily-found thumb position, and can be used as a point of departure for extensions and shifts to higher positions. 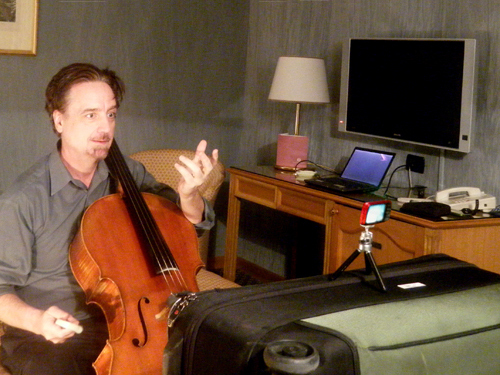 On the Emerson Quartet tour stop in Naples, David filmed his 50th Cello Talk, a milestone in his groundbreaking, ongoing series of lessons on all aspects of cello playing. Even without promotion, the number of viewings has grown to over five hundred per week, and he is receiving increasing numbers of questions, comments and thanks as the project progresses. My father, besides being a jazz performer and arranger during the Big Band era (before I was born), eventually gravitated to classical music and became a prolific teacher. In addition to his role as Director of Music at Far Brook School, in Short Hills, NJ, he taught privately in our home in Madison on the weekends. Our house was always full on Saturdays with a steady stream of students and parents, and it was only a few years after I began cello that I followed my father’s footsteps and began giving private lessons. Besides youngsters my around my age, I had a student who lived across the street named Burton Smith, and he must have been at least 50 years old. That was a real wake-up call: that I could help someone so much older than I. I had a wonderful, strict teacher named Mary Gili who grounded me well in Popper Etudes, the Saint-Saens and Dvorak Concertos, and very importantly, the Aldo Pais method for the left hand, an incredible book of exercises that I still use to keep in shape. Not long after, I began my lessons with Rostropovich, but he never offered technical advice: it was up to me to figure it all out. This method of self-teaching, and learning through observation and imitation, is really the way I learned to play the cello. After I became involved in chamber music my private teaching basically ceased, except for a couple of dedicated students who were willing to put up with my ridiculously unreliable schedule, among them Adam Grabois, who I’m proud to say is one of the best-schooled cellists I know. The idea of teaching seriously – of being responsible for the instrumental education of fine young talents – was a commitment I knew I could not handle, and I began to regularly turn down requests to teach, until finally, no one asked anymore. I was even turned down by the Manhattan School of Music in about ten years ago when I wanted to teach there. I had no reputation as a cello teacher, and to a certain extent, I still don’t. But I have to say that I must have accumulated some knowledge from all the hundreds of works I’ve learned, the thousands of concerts I’ve played, and the many great cellists I’ve been privileged to work with. I began to wonder what would happen if I was to be run over by a bus: all the knowledge that I’ve gathered, which gets me from note to note and concert to concert would be gone, and I would not have done what I could to share potentially useful information. I’ve had a lot of gratification coaching chamber music, and for sure, designing and directing the many education programs under my watch, from Music@Menlo to Lincoln Center. But in none of those situations do I have the time to share my convictions about details of cello playing, and to be honest, in many chamber coaching situations I do know that my young players would be better off if they knew more about vibrato, about intonation, about how to set up their instruments – in short, all the subjects that I am covering in these videos. So somehow, the idea came to me to do this, and it has been a wonderful learning experience for me as well, as it’s forced me to articulate and systematize my methods. I know, for sure, that I am a better cellist myself now than when I began the project. I hope that people are getting something out of these. At least I know that I am doing what I can, that I am revealing bit by bit all that I’ve learned. I’m sure people who teach regularly, who have really made an art of it, can do it better than I. But no one is a prisoner of me or of these little videos: they are free, and you can believe them or not – some things may work for you or not. We are all different and there is no one way to do anything in music. At the very least, I’m sure, some may find them entertaining. I’ll try to keep them practical and useful, and waste as little time as possible. Thanks for reading, and for your interest in this project. These positions, which lie between the final lower position (4th) and the first obligatory thumb position (8th) can be thought of as extensions of the 4th position and are best practiced in sequence. Third position is easy to locate if you reach back to it from fourth. Treat the two positions as closely related and you’ll be very comfortable in the upper half of the lower fingerboard. Knowing the fingerboard well and playing in tune is not only about practicing consistent hand positions: there’s also developing your intuitive sense of where pitches lie, and remembering how the hand, arm and body feel when you’re playing them. Second position has four variations which are all commonly used. Here they are, along with how to make sure each is in tune, and how to get to second position from first position.